Why exactly are Nyagah and his lawyer Havi untouchable, even as the DCI recommends they be charged in massive fraud scheme? Has their political elitism rendered them completely immune to the rule of law? 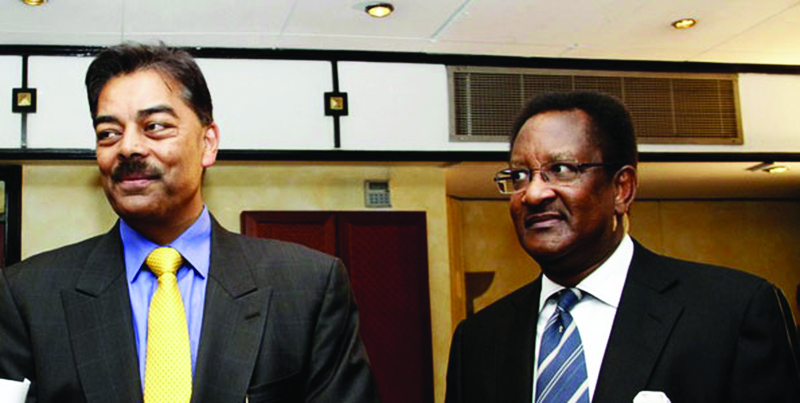 And how closely involved are Nyagah’s business partners Vimal Shah and Steve Mwagiru? Vimal Shah and Nahashon Nyagah. Together with Steve Mwagiru, they are accused of attempting to defraud Tatu City investors. A report by the Directorate of Criminal Investigation (DCI) has reportedly found former Central Bank of Kenya Governor Nahashon Ngige Nyagah and a dozen others of being criminally responsible for conspiracy to defraud the owners of Tatu City and the neighbouring Kofinaf estate of Sh5.3 billion worth of land. The stolen land is owned by Kofinaf Company Ltd, which is in turned owned by a Mauritius-based company called Cedarsoc Ltd, which also owns in Tatu City. Kofinaf, according to the report, owns about 7,500 acres of coffee farms in Kiambu County, with several land titles and other holdings such Eaagads and Garton Ltd. These farms were formerly owned by a Belgian company called Socfinaf. In the report that the Nairobi Law Monthly has obtained, the DCI names Nyagah alongside Jeremy Njeru Nyagah, Judy Wanjiku Ngugi, Jane Gachoka, Rachel Murugi Mugo and Eunice Waithira Mwangi. Nyagah, Nairobi lawyer Nelson Havi and Nyagah’s brother, former Gachoka MP Norman Nyagah, are also accused of witness tampering, as well as issuing threats to the DCI. “Going by the evidence already collected, we find that Nahashon Ngige Nyagah, chairman of the Board of Directors of Kofinaf and Tatu City, to be criminally responsible for the offense of conspiracy to defraud, contrary to section 317 of the Penal Code, alongside Jeremy Njeru Nyagah, Judy Wanjiku Ngugi (directors who made decisions to transfer without the consent of Galba Mining the majority shareholder), Jane Gacoka (the new director of Purple Saturn, who allowed for Nara Company to receive shares with the consent of Galba Mining) and the two directors of Nara Company, namely Rachel Murugi Mugo and Eunice Waithira Mwangi. Others are to be revealed as we progress,” the report to the Director of Criminal Investigations Ndegwa Muhoro of August 24, 2015, states. The final report was due to be sent to the Director of Public Prosecutions Keriako Tobiko, but lawyer Havi is accused of getting the report held up at the DCI. The preliminary report has unearthed a complex web that was used by Nyagah and his associates to transfer shares from real Tatu City owners valued at Sh5.3 billion. Lead Tatu City investor Stephen Jennings, in a recent public speech about the fraud, called the group’s efforts to steal the project “Alice in Nyagahland”. Nyagah had been the Tatu City board chairman, a position he is said to have been rewarded with after acting as a go-between for the American and international investors led by Stephen Jennings. According to information that NLM has obtained from the DCI, former Tatu City CEO Lucas Omariba, Bidco Oil chief executive Vimal Shah and others who were part of the network allied to Nyagah have resisted being interviewed or recording statements with investigators. Instead, all the suspects have obtained constitutionally questionable injunctions against their prosecutions – some have been lifted. The report states that Nyagah made no direct investment in the project, and was only brought on board for helping the foreign investors to acquire land in Kenya; he did not, does not own a single share in either Tatu City or Kofinaf. Instead, his appointment to the board was a reward for having acted as a go-between for the foreign investors. “I find that although Nyagah was the chairman of Kofinaf and Tatu City, he cannot account for any financial contribution made by him to purchase the companies, Kofinaf Co Ltd and Tatu City Limited besides the trust based on him via the foreigner partners who he introduced to the properties,” the report states. Tatu was the first estate purchased by Renaissance Partners owned by Jennings in 2008 for $20 million (Sh2.12 billion at current rates). In 2009, Jennings asked his local partners Vimal Shah, Nyagah and Stephen Mwagiru (he owns a minority share in Blacknight Holdings, Mauritius, which owns a stake in Cedarsoc Ltd) to contribute collectively $62.5 million (Sh6.63 billion) for the purchase of additional nine farms. They could not. “Jennings then organised the finance for Cedarsoc via Renaissance Partners for the amount $62.5 million secured against the Tatu City land title in order to purchase the remaining nine farms of Socfinaf (The company name was changed from Socfinaf to a public company known as Kofinaf Co Ltd after it was bought from the Belgians). Jennings and his offshore investors – being foreigners – could not own agricultural land in Kenya. Therefore Nyagah, having assisted to find the properties, was asked to provide a number of nominee trustee shareholders on behalf of the foreign ownership via Cedarsoc in Mauritius,” the investigation states. The local partners consisting of Shah, Nyagah and Mwagiru were then offered a 50 per cent shareholding through their special purpose vehicle called Manhattan Coffee Investment Holdings (MCIH). The trio did not have the money to invest, so Jennings and partners lent them nearly $11 million for their 50% stake in Tatu, but they never paid it back. Cedarsoc was to repay the loan of $62.5 million with revenue from land sales. “This did not happen as planned as Stephen Mwagiru placed illegal caveats on the land titles in order to defraud the other partners, including the foreigners. While Kofinaf could not sell farms because of Mwagiru’s actions, the loan repayments by Cedarsoc were made by the complainant, Jennings, and his other foreign investors. Manhattan Coffee Investment Holdings could not pay their share of the Cedarsoc loan either. Therefore the Manhattan shareholding was reduced to a 23 per cent stake of Cedarsoc as per the original loan facility agreement accepted by a commercial court in Mauritius (that part and the formation of the Cedarsoc company is under the jurisdiction of a Mauritius court),” the preliminary report states. In 2013, the partners formed another company, Purple Saturn Limited, to hold the land title from Kofinaf at Ruera, LR 11288, measuring 1,183 acres of, whose approximate value today is Sh5.3 billion. The DCI reports that at the time Purple Saturn Limited was formed, Nyagah was asked to provide Kenyan nominees to hold shares in trust – later it became a public company and the majority of shares were held by the foreign ownership another company, Galba Mining Limited of Mauritius, wholly owned by Cedarsoc. Having gone through the process smoothly, the same procedure was to be used for Purple Saturn. The nominees were appointed by Nyagah and coordinated by Omariba in 2013. According to the report, Daykio was to finalise the purchase of Purple Saturn in early 2015. However, by this time relations with Nyagah, Shah and Omariba collapsed to the point that the board passed a majority written board resolution on February 5, 2015, to remove Nyagah as chair, and Omariba as CEO and board advisor to Kofinaf Co. Ltd. The board then appointed Pius Ngugi of Kenya Nut Company, a director and chairman of the Board of Directors of both Tatu City Limited and Kofinaf. Investigations to establish how Nara Properties purchased the shares from Kofinaf (Cedarsoc being majority shareholders) for the farm in Ruera measuring 1183 acres, have yielded nothing as Nyagah and all his associates have failed to account for any financial transaction made by Nara to purchase these shares in Purple Saturn. In any case, the DCI report observed that directors of Nara did not even know the location of the property in which they hold shares. “I find that all of the persons nominated to hold shares in trust for Purple Saturn in 2013 were related to Nyagah through the church, through family relations or by way of employment. There is no financial transaction showing that these shares owned by Nara were actually purchased from Purple Saturn or Kofinaf (Cedarsoc). They were only compelled to sign documents by Nahashon Nyagah, Lucas Omariba and Nelson Havi,” the report states. 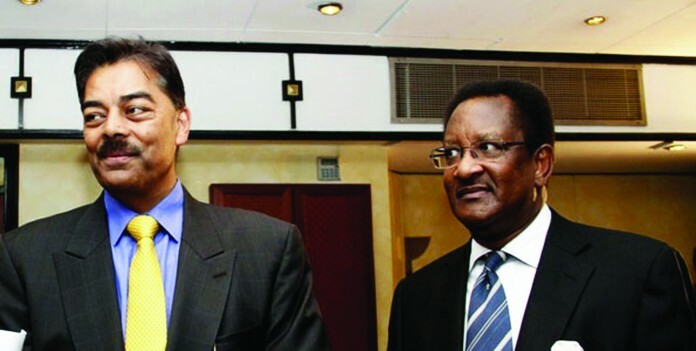 In addition, the DCI accuses Havi of having introduced himself to Anjarwalla and Khanna Advocates as the advocate for Purple Saturn without the consent of Galba Mining of Mauritius, who are the majority shareholders, and immediately demanded that the land titles and all other associated documents be released to him. Meanwhile, Jane Muthoni Njanja, a friend of Nyagah’s sister Rachel Mugo, who is listed as a nominee shareholder in Purple Saturn since 2013 and holding shares in trust for Galba Mining Limited told the investigators that the signature on her declaration of trust was not hers. “Norman Nyagah, former MP Kamukunji, has been interfering with investigations, not wanting anybody from the side of Nahashon Nyagah to be interviewed. He has threatened investigators via the phone of advocate Nelson Havi, xxxxxx, to mobile number xxxxxx (criminal investigator). The advocate Havi has been coaching the nominees of Nyagah in the companies on what to write,” the investigator determined. According to the report, when the DCI objected the admission of Havi’s statements and eight witnesses were interviewed afresh on August 22, 2015, they all contradicted themselves. This is a very sad story if at all its true. Probably the international investors would have by now spend billions in the country which will have a multiplier effect in the economy. Ver sad story to con international investors if what we are reading is th truth. This does nothelpkenya attract international investors.